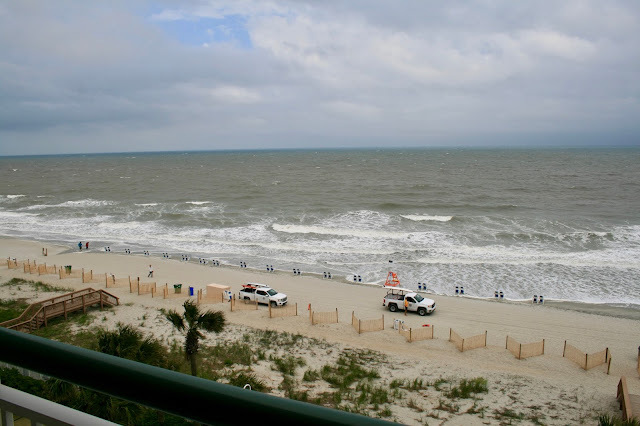 I am back from a ten day road trip to Myrtle Beach (with a short stop in Charleston) with my husband. As usual we drove, it was a twenty hour drive and 1,276 miles. This trip we didn't face any car problems (thank God!) or traffic jams (we looked ahead using my Smart Phone and bypassed them). But we did have to drive through some treacherous spring storms right through the Smokey Mountains. That was stressful! We started our trip on Friday afternoon arriving in Wheaton, Illinois around 7:00 p.m. We spent the night with our children and said our goodbye's to Jackson (our cat) the next morning. For those wondering how Jackson did without us for ten days: very well. In fact, he didn't even seem to care when we showed up to pick him up. I think he enjoyed living with our kids for ten days and did not miss us at all. Little stinker! The next day we only had to drive six hours to Richmond, KY. When we arrived at our hotel, we had plenty of time to shop, eat a leisurely dinner, and get plenty of rest before the long drive the next day. The next morning we woke up around 5:30 a.m. because we wanted to get to Myrtle Beach as soon as possible so we could enjoy Sunday evening there. It was a nine hour drive, and we got there around 5:30 ET. 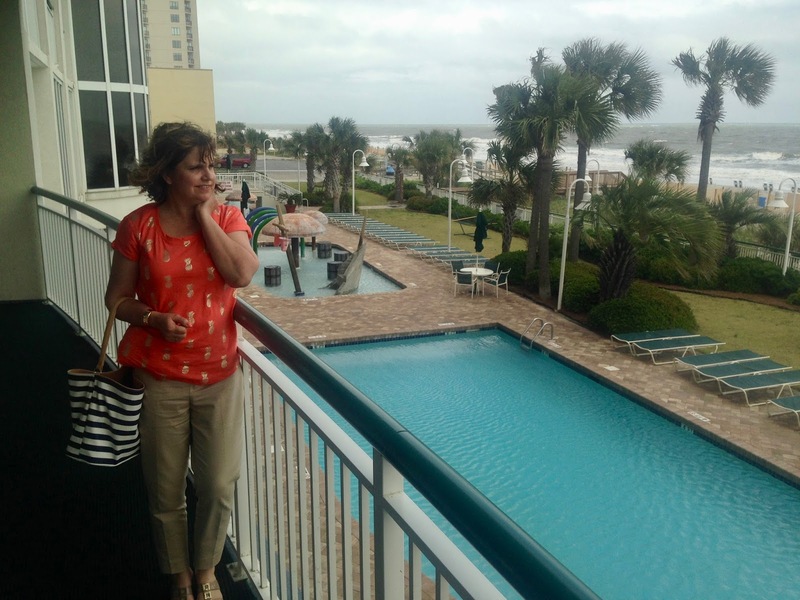 When we arrived at our hotel in Myrtle Beach, the first thing I noticed when I walked through the hotel lobby was the ocean. The winds were so strong, they felt hurricane force to me, and they produced large waves. We stayed at the Hampton Inn and Suites which is listed as the Number 1 hotel in Myrtle Beach on Trip Advisor and Number 2 on The Travel Channel. It is an absolutely gorgeous hotel located right on the beach. The beach theme decor in all the rooms of the hotel is so stunning. They offer free parking, free breakfast, multiple indoor and outdoor heated pools, a spa, and much, much more. When we first got there, we just walked around the grounds of this stunning hotel checking out all it's amenities. In the picture below I'm standing on one of their many decks outside the commons area overlooking all their pools and the ocean. 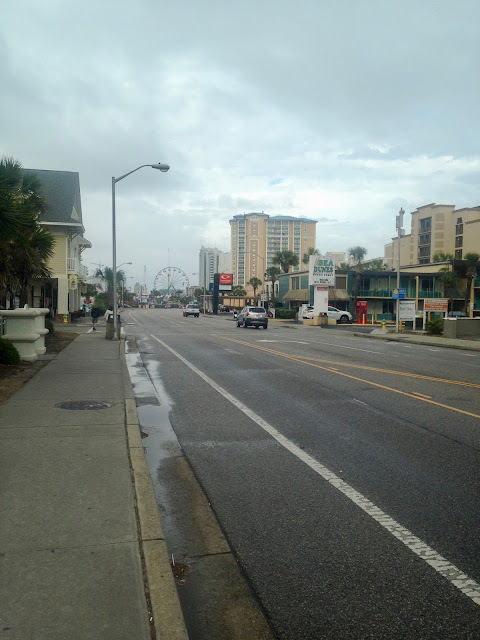 When we were in Myrtle Beach it was still the off-season, plus it was a Sunday night, so it was pretty quiet. At first we thought we might have the whole place to ourselves, but more guests arrived later and breakfast was pretty full the next morning. They had two lazy river pools and two children pools. There was an adult pool outside, and several more inside plus a jacuzzi. And the best part was, all the pools were heated quite warm so even though the weather wasn't really hot when we were there, we could still enjoy the pools. The breakfast area was GORGEOUS! I could decorate my house like this I loved it so much! 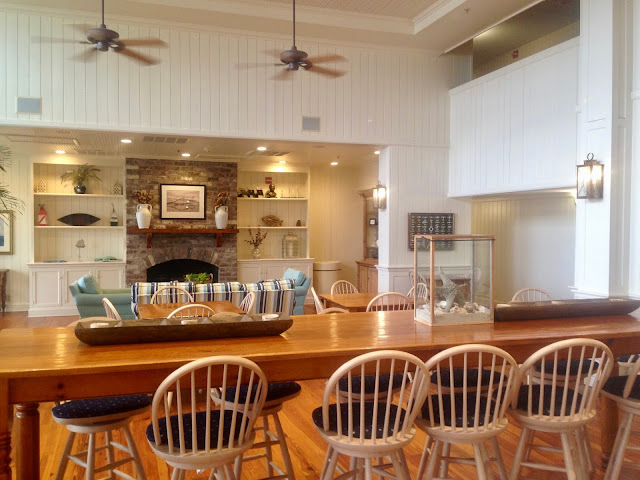 Every morning it was a joy to sit in this room and eat breakfast and gaze out at the ocean. There were huge picture windows facing the ocean. And yes, the breakfast was wonderful every morning. As I stated previously, the entire hotel was decorated in a sea-side theme with lots of ship lap paneling, beachy colors, shell decorations, and nautical prints. 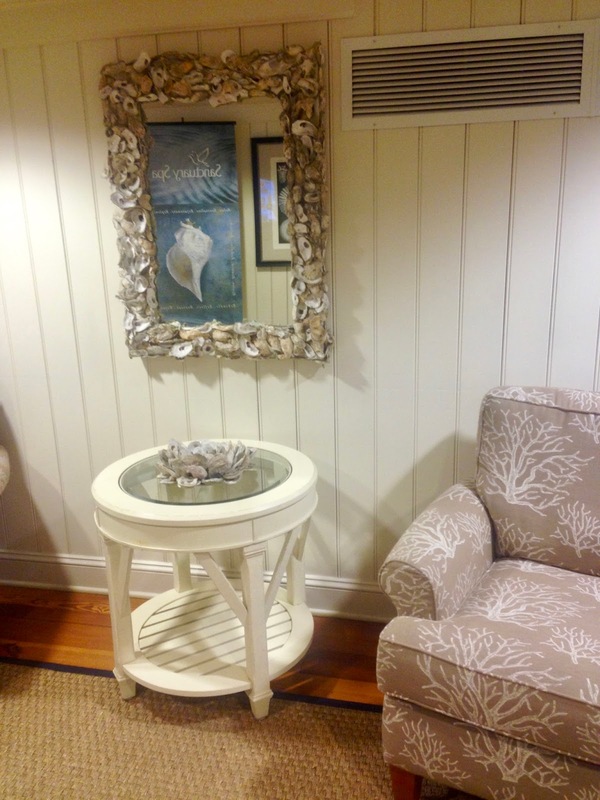 I LOVED this seating area with the seashell mirror, the coral reef print chair, and even a seashell centerpiece. 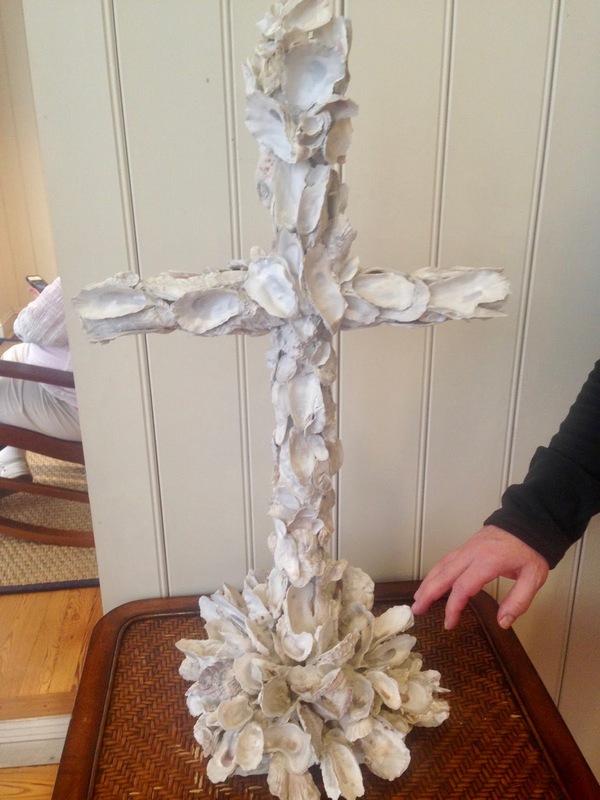 Being Christians, my husband and I couldn't help notice all the Christian crosses scattered about the hotel. There was one made of driftwood and also this one made of shells. We later discovered a sign that explained that told the history of the hotel and how the owners dedicated the hotel and it's guests to the Lord. We thought it was more than a coincidence that we surprisingly ended up at a hotel owned by Christians. They even had a Sunday Morning Service and a Wednesday Night Bible Study in the hotel. How cool is that? After we explored the hotel, we went to the car to get our bags and check out our room. I was so excited when I opened the door and saw our beautiful ocean front view! The room was a little small, but it was so cozy and had everything we needed. We loved the nautical decor. The bathroom was also quite spacious, I only wished it had some counter space to put my toiletry bag on. I ended up having to set my bag on the floor, and it was a pain for me to bend down every time I needed something out of the bag. The chair in our room had this cute seashell print. 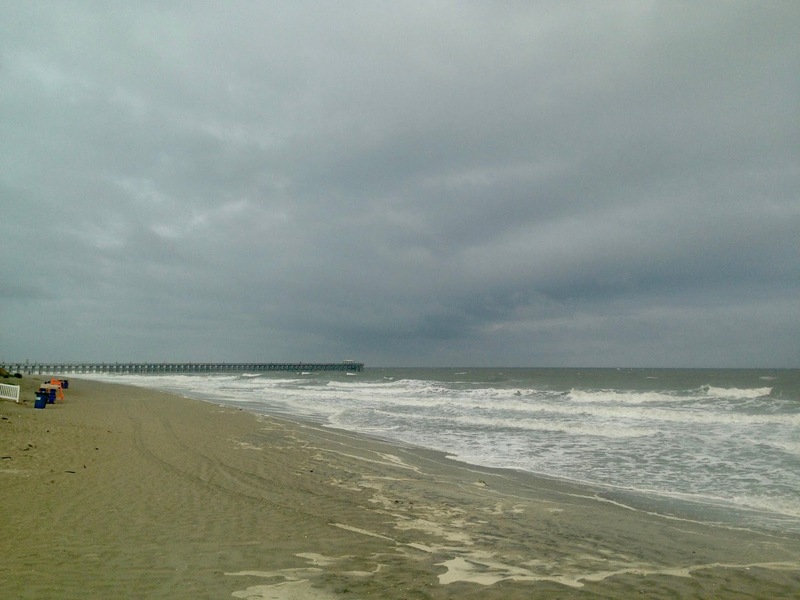 After spending all day in the car, my husband was anxious to walk so we headed outside to check out the beach. 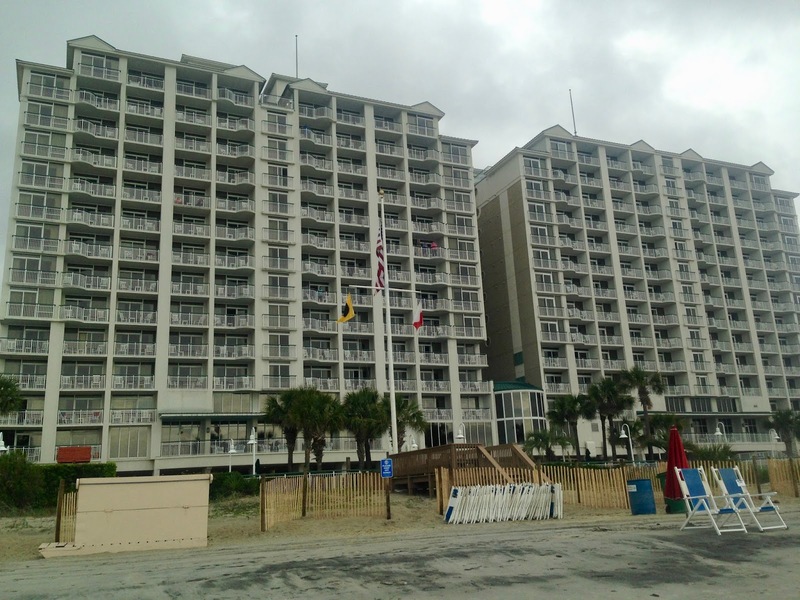 This is the view of our hotel as seen from the beach. After a brief walk on the beach, we headed down the street to check out the town. 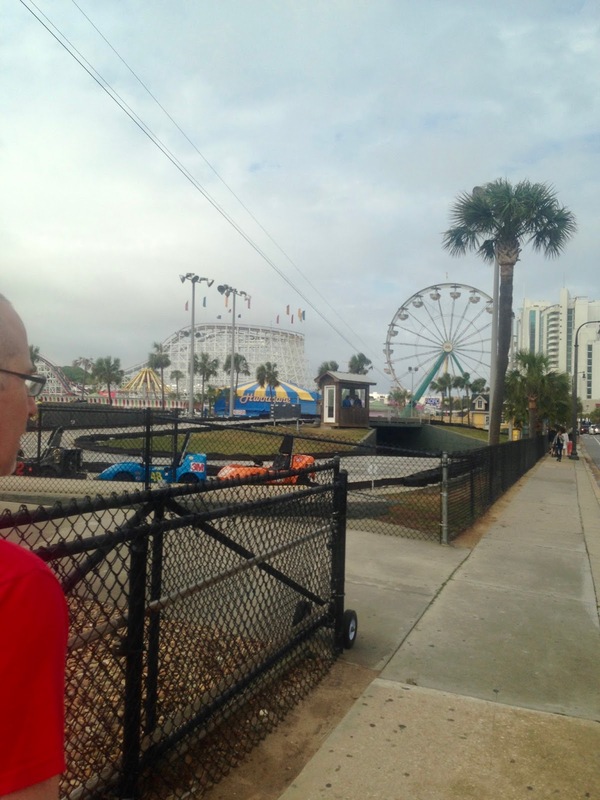 Our hotel was about 1.2 miles from the boardwalk, but there was still plenty of other restaurants and activities within walking distance like the Family Kingdom Amusement Park and Splashes Ocean Front Water Park. 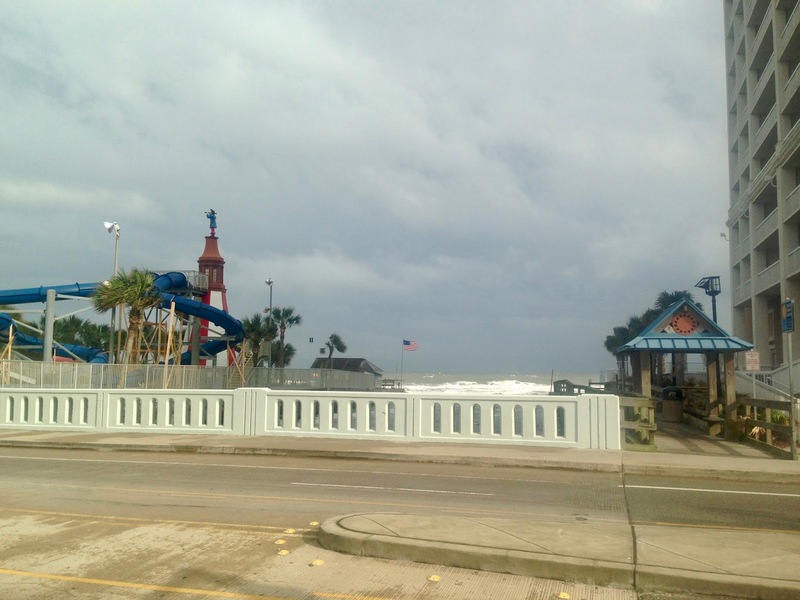 The winds felt practically hurricane force the night we arrived. There were times I could barely stay on my feet! But it was still warm and humid compared to where we had come from, so we enjoyed it! 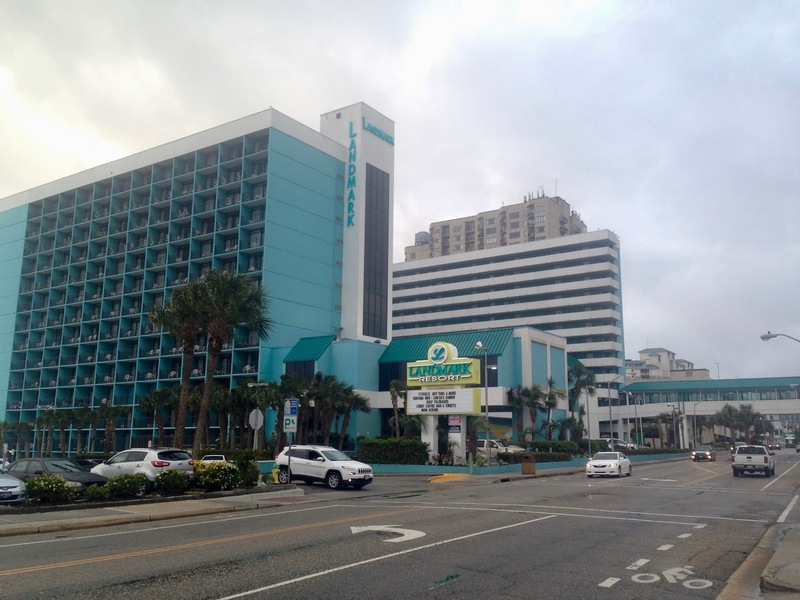 I had read a lot of reviews about Myrtle Beach being run down or having a lot of shady characters, but that wasn't my feelings when I was there. Yes, there are areas where you will experience a larger cross section of society and there are also upscale areas where the elite members of society tend to hang. We enjoyed spending time in both areas, and although we met a couple of interesting characters, we never felt unsafe. BUT, we also were never out at night. We are early-to-bed-early-to-rise type of people, so we were always safely back in our hotel at night. 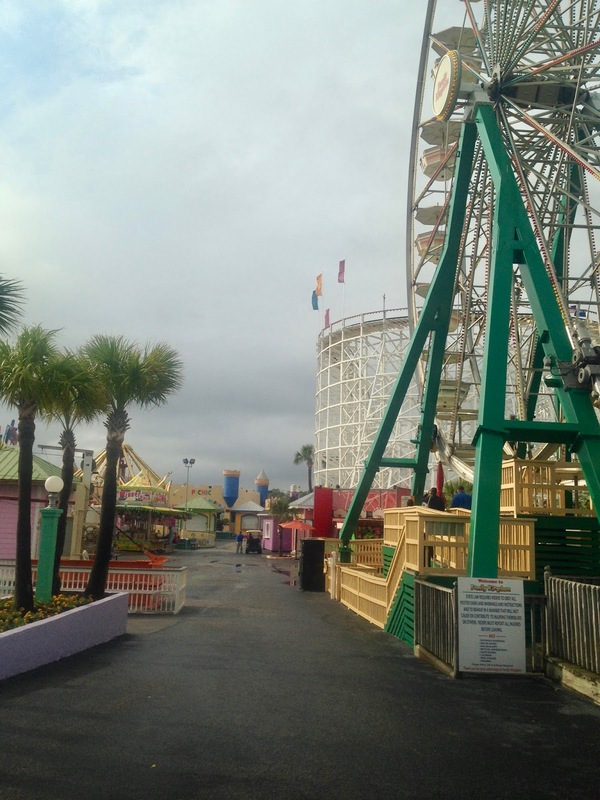 I also read a lot of reviews about Myrtle Beach being too touristy. My thoughts on that is that all beach towns are touristy: it is typical for a beach town to be filled with lots of hotels and attractions. If you don't like touristy, don't go to a beach town and pick a state park instead. There are two state parks in Myrtle Beach which are very natural and peaceful. We went to both and I will share our visit to those parks in a later blog post. If you walk down the streets of Myrtle Beach you will see lots and lots of hotels (some new, some vintage), amusement rides, mini-golf, restaurants, and gift shops. The Landmark was one of my favorite hotels on Myrtle Beach. I just loved the color and the sky walk. We walked so far our first night that even though I wore very supportive sandals, my feet and hips were aching! We walked all the way to Pier 14 Restaurant and the very start of the boardwalk, then we decided it was time to find a place to eat dinner. 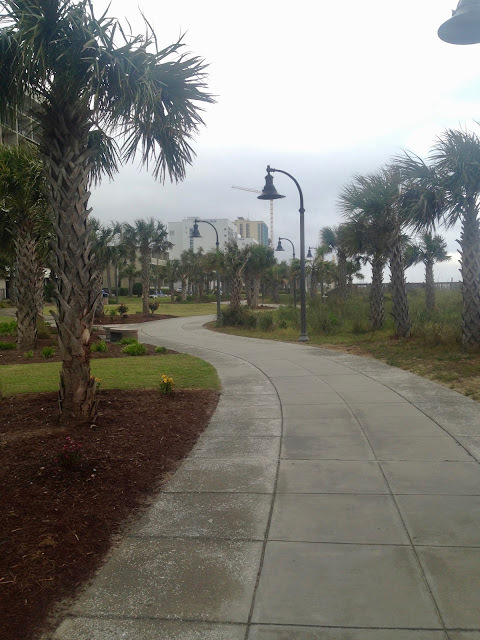 This is the beginning of the Myrtle Beach Boardwalk. It eventually becomes a wooden boardwalk when you get closer to the historic section of town, but it starts as a concrete boardwalk. We ate dinner at this chain restaurant, which was new to us as we hadn't heard of this chain before. 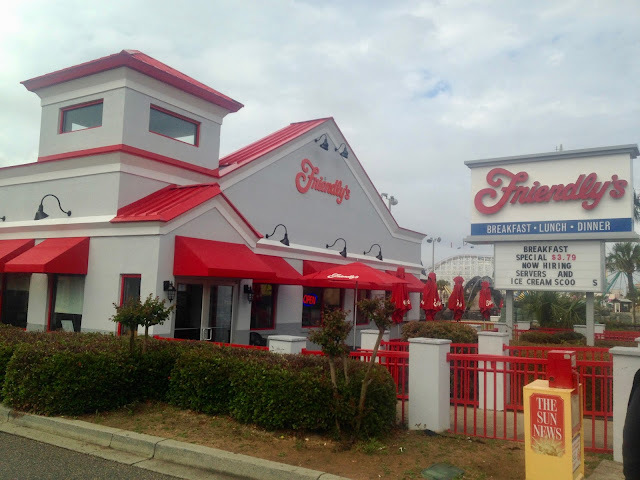 The prices were super inexpensive, the food was great, and the service was excellent. We liked it so much, we went back another day just for ice cream. We were really impressed with the waitresses we had both times. They were so friendly....hmm, I wonder if that has anything to do with their name! After dinner we went back to our hotel and spent some time in the outdoor jacuzzi. It felt so good soaking in that hot water after a long drive and a long walk. I love outdoor jacuzzis! It feels wonderful when there is a little chill in the air! Next week I'll share our first full day in Myrtle Beach, which was a rainy day so we went to a upscale shopping center called The Market Commons. Wow! Thanks for the mini-vacation! The hotel looks beautiful and what a view!! Wish I could travel in off seasons! Thanks Elli! We loved our hotel. We only travel during the off season and it has it's positives and negatives. The most positive is more inexpensive prices and no crowds. The negatives are somethings aren't always open and weather. Thanks Jeannie. 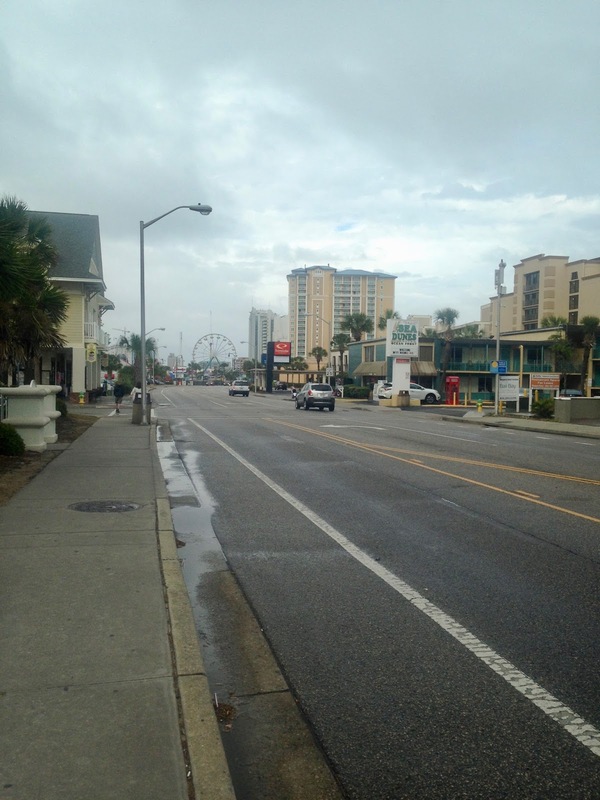 It seems to be a common thing that people who live near Myrtle Beach have never been there. So odd. 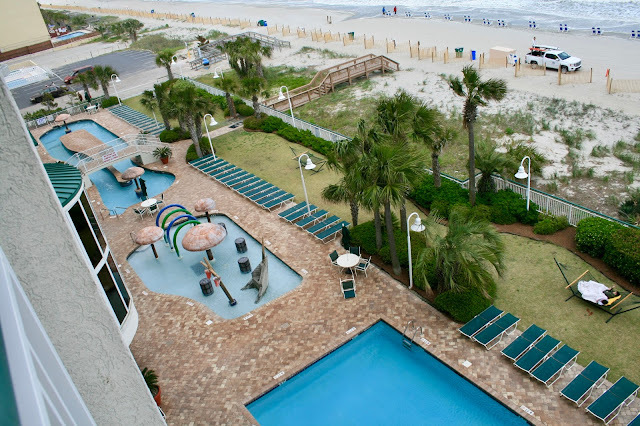 We had been to Florida so many times we wanted to try some place different, that's why we decided on Myrtle. Love all your pics! How nice that the hotel owners are Christians and host a Bible study! People always seem to be so nice whenever we have gone down south. I'm sure it is because there is such a strong Christian culture. Thanks Karen. Yes, we notice a distinct change in personalities when we travel. People in the south are definitely the nicest and have the best manners. Goodness, your holiday is busy. Looking forward to your first full day. Our Boston rellies usually have a holiday there to meet up with family from NC, so I'm intrigued to hear and see more as they ask us to join them but I don't like long haul flights so much these days. Love that red top, hope we get to see a close up of it, looks great with the beige trousers. Yes, it was busy...and exhausting. Or, I'm getting old. I was tired a lot on this trip, which concerned me and made me wonder how many more traveling years I have left in me. We did do something everyday that required a lot of walking so that was part of the problem. 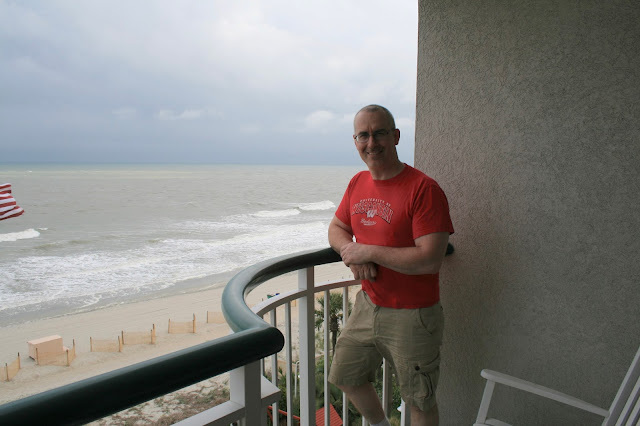 As for the red top, I plan on doing a "What A Wore On My Vacation" fashion post on Friday so you'll get more details! The beach is my happy place! 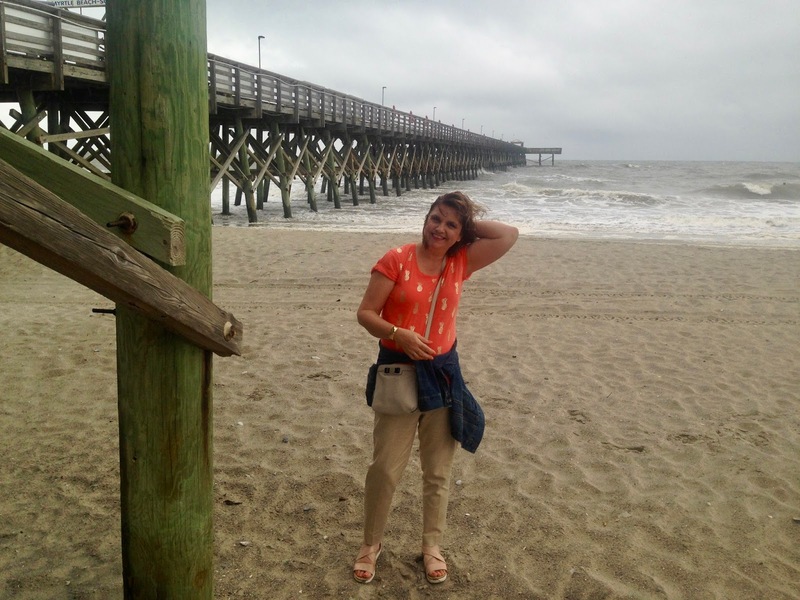 We experienced the wind last month when visiting the Texas coast too...I'd rather have a little less of that but being near the water just calms me so. Thanks for sharing with Royally Waiting Amy! Mine too! I loved the ocean front and hearing the sound of the ocean all the time. Thank goodness the wind only lasted one day! 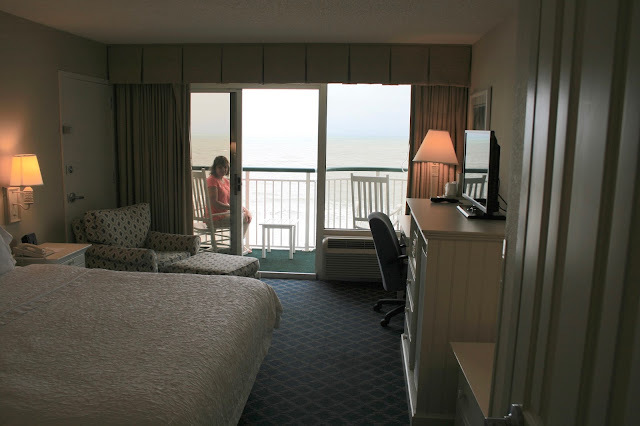 Your trip looks awesome- the beach views are wonderful! And, I live in Wheaton Ill as well! Small world! 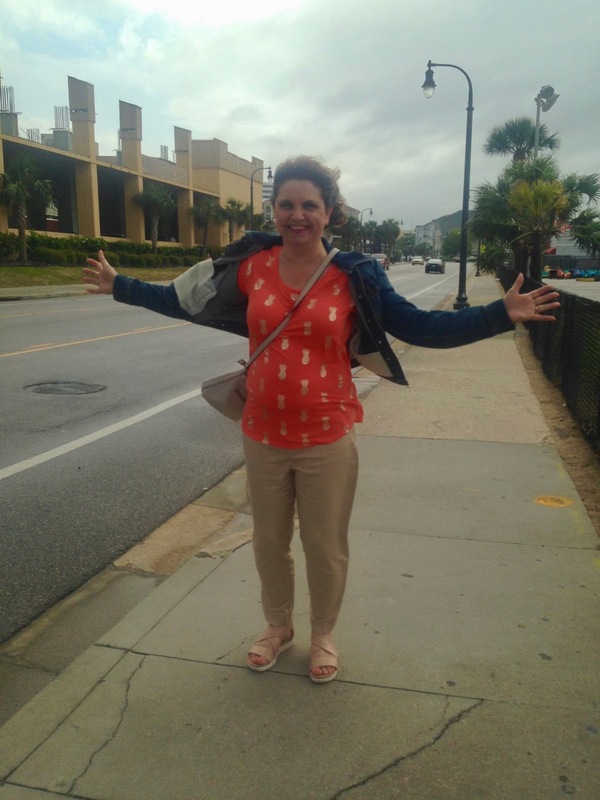 I have not made it to Myrtle Beach yet- sounds like you had a great experience with the town and the hotel too! Thank you! Yes, you've mentioned before you live in Wheaton. Sometime when I visit we should meet up for coffee! What a fun adventure Amy---you guys do the neatest things!! I've been to Myrtle Beach over 15 years ago, but it wasn't at a good time of my life, so I can't remember a thing about it! I love that your hotel was so homey!! I never realize Hampton Inns were so nice!! Thanks Jodie. Although all Hampton Inns are good they are not like this one. This is a very different Hampton Inn from the norm.